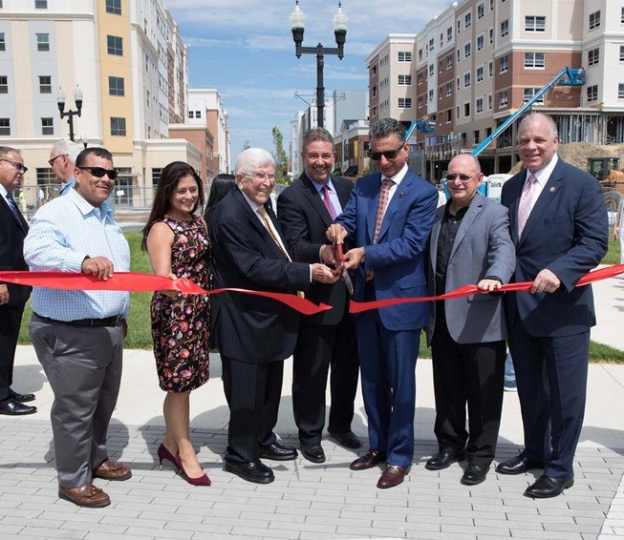 Joined by New Jersey Senate President Steve Sweeney, Glassboro Mayor Leo McCabe, Rowan University President Ali Houshmand, and Gloucester County Freeholder Heather Simmons, Nexus Properties celebrated the official ribbon cutting of the largest phase of Rowan Boulevard, known as A3. The A3 development – part of Glassboro’s transformative multi-phase redevelopment called Rowan Boulevard – is composed a unique mix of luxury student and market-rate apartments, retail and office space, state-of-the-art classrooms and a multi-level parking garage. The opening represents perhaps the most significant milestone to date in the $400-million “public-public-private” development initiative, which has already established a magnetic, inter-generational town center serving to even more closely link the burgeoning Glassboro community and Rowan University, one of the fastest-growing institutions in the nation. In total, the A3 development encompasses more than 336,000 square feet across four acres, serving as a direct extension of the already-bustling Rowan Boulevard, which anchors Glassboro’s emerging downtown. A3’s new student and luxury residences are located just steps from Glassboro’s newly opened Town Square, along with Rowan Boulevard’s myriad dining and shopping options, including the Barnes & Noble University Bookstore and the newly opened Chickie & Pete’s restaurant. The project continues an innovative model in which private developers, led by Nexus Properties, have joined with Rowan University and the Borough of Glassboro to conceive a city-style walkable hub that serves both as a nucleus for the university and a destination for surrounding residents. Students living on Rowan Boulevard have access to a rare combination of quality design and proximity to campus. Each new residence offers “suite-style” living, with an amenity package akin to today’s most in-demand luxury living options, including: A state-of-the-art fitness center, free Fios wi-fi, package concierge, spacious community lounge areas, stainless steel appliances, full size washers and dryers, and 42-inch smart TVs in each room. Students also have access to indoor parking for cars and bicycles. The new student residences open during a period of immense growth for Rowan University. As the region’s leading public research university, Rowan’s enrollment has grown by more than 7,000 since 2011 to enroll more than 18,000 students this fall. While distinguished as one of only two institutions in the nation with medical schools granting both M.D. and D.O. degrees and ranked as a Carnegie-classified research university, Rowan remains dedicated to undergraduate higher education, with students’ residence life a critical part of the undergraduate experience. A3 includes modern classroom space specifically designed for Rowan University’s College of Communication and Creative Arts. While Rowan Boulevard’s continued realization has undoubtedly been a boon for Rowan University, it has also proven to be a magnet for residents and professionals throughout the region. Retailers at Rowan Boulevard are open year-round, offering an assortment of restaurants, shops, health & beauty services, and more. Additionally, demand has been strong for the development’s non-student luxury apartments, as more than 30 of Park Place South’s 37 apartments have already been leased. In 2015, Nexus Properties opened 220 Rowan Boulevard, a 316,000-square foot mixed-use building which includes retail, medical facilities, student housing, and 57 luxury apartments; each of its non-student apartments are fully occupied. A3 represents the second-to-last component of the Rowan Boulevard redevelopment project, which is composed of four core phases spanning through 2018.